Everytime for a gathering or in daily routine for evening snacks, I am always looking for recipes that are quick, can be served to large audience in less time, not messy and off course tasty!!! These fritters are a winner in all these ways. 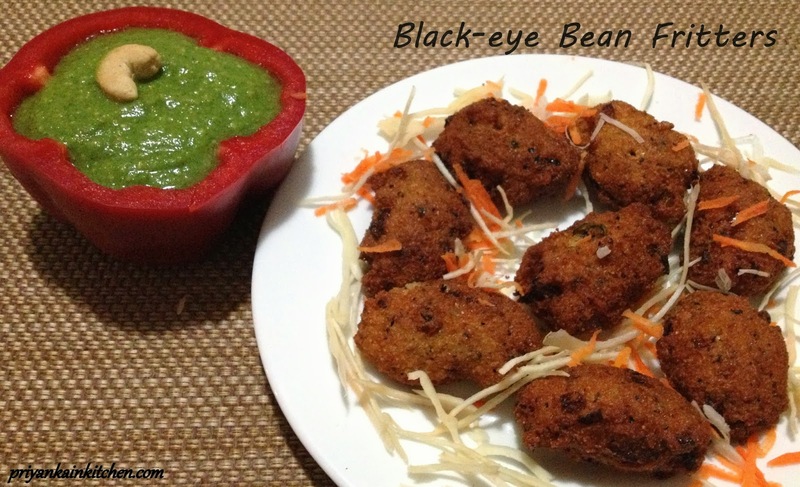 Soak black eye beans with green gram for 4-5 hrs. Drain the water and add to a grinder. Also add ginger and chilies. Grind to a thick and course paste using minimal water. Take out in a bowl, add onions and salt. Heat oil in pan. When medium hot, shape batter with your hands and put in oil. Alternatively you can use a spoon. Make fritters by adding spoonful of mixture to hot oil. Fry on medium till golden brown. Serve hot with Mint & Fennel dip or with any other dip of your choice.